FILE - The Department of Homeland Security logo is seen at one of its annex facilities in Fairfax, Virginia, July 22, 2015. The Trump administration's new rules for a U.S. visa program widely used for technology workers are getting cautious praise from Silicon Valley amid surging demand for high-skill employees. 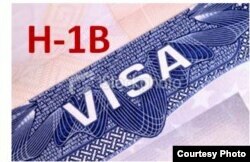 "U.S. employers seeking to employ foreign workers with a U.S. master's or higher degree will have a greater chance of selection in the H-1B lottery" under the new rule, said Francis Cissna, director of U.S. Citizenship and Immigration Services, in announcing the change Jan. 30. The changes come with the tech industry's plea for more immigrants to fill key skilled positions, and respond in part to concerns that the program has been exploited by some tech giants and outsourcing firms to depress wages and displace U.S. employees. "The changes are, on the whole, a positive step," said Todd Schulte of the immigration reform group FWD.us backed by Facebook founder Mark Zuckerberg, Microsoft founder Bill Gates and others in the industry. "We are hopeful something in the newly announced revisions will improve efficiency, but it's too soon to say what the impact will be," Black said. He said that the reform "inches us a little closer to a better-quality pool, but it's still not selecting the 'best and brightest' — you could reform it much better." William Kerr, a Harvard University professor who heads the university's Future of Work initiative, agreed the changes could slightly shift the mix of those receiving H-1B visas to bring in more people with advanced skills. "People were talking about shutting down this program and making it hard for companies to use [visa holders] at all, so it could have been a lot worse," Atkinson said. The change, he said, "sends a nice message to foreigners who have been dropping their enrollment in U.S. universities and who were feeling uncertainty about what Trump was going to do."